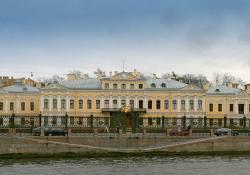 This palace is known as well by the name “the Foun­tain House”, as it overlooks the River Fontanka. This building is a remarkable monument of the 18th century Russian architecture. In 1712, Peter the Great presented this plot of land to Field Marshal Boris Sher­emetev. Count Boris Sheremetev didn’t live there himself, because he had a splendid house near the present Millionnaya Street. The first owner of the house was his son, count Pyotr Sheremetev. First, between 1720 and 1740, the wooden building was erected, but it was reconstructed between 1750 and 1755 by two outstanding architects Fyodor Argunov and Savva Chevakinsky. The big two-storeyed stone palace was built. There were three parts: the main building and two wings. The building was decorated with moul­ded heads over the windows and beautiful ornamenta­tion. There were service rooms, kunstkammer and wea­pons room on the first floor of the palace. The main apartments were situated on the second floor. They were decorated with gold-plated carvings, painted ceilings and panels. Lots of the furniture, paintings, bronze objects and sets of dishes were brought from Europe. Behind the palace a spacious park was laid. It was a big regular garden with classical sculptures and foun­tains. There was a grotto, a Chinese bower and the Hermitage Pavilion. Later this place was sold and the dwelling-houses were built there. In front of the palace there is a great railing. This railing was made after the design of the architect Ieronim Corsini between 1837 and 1838. The gates are decorated with the Sheremetevs’s coat of arms. In the left part of the main yard the single-storeyed service house with gates was built in 1867. This buil­ding was designed by the architect Nicholay Benois. In the middle of the 19th century the palace was oc­cupied by the Field Marshal’s descendant, Nicholay Sheremetev. He was one of the richest men in Russia. The composer Mikhail Glinka used to visit the palace. When the artist Orest Kiprensky lived in this house, Alexander Pushkin sat for him. Kiprensky painted his portrait. The poetess Anna Akhmatova lived here for the great part of her life from 1924 till 1952. She deserved the title of the “Sappho of the 20th century”. Her muse was lyric and she also expressed the tragedy of her Mother­land in her poems. Nowadays, in the flat of Anna Akhmatova a memorial museum is located. After 1917, in the Sheremetev Palace a museum of the everyday life of nobility was established. In 1990, the palace was given to the Museum of The­atre and Music. Sappho - Сапфо (Сафо) древнегреческая поэтесса 7-6 вв. до н. э.